For a company known for colorful, cute games, Nintendo's Kyoto headquarters is anything but. The first floor lobby—covered in white marble—looks more like an insurance company's than one of Japan's most creative companies. 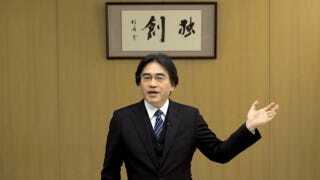 During a recent video presentation, Nintendo president Satoru Iwata noted that the room he was speaking from was plain. However, above Iwata, there was the kanji "dokusou" (独創) written in calligraphy. In Japan, it's not uncommon for companies to hang kanji that conveys corporate ideology and inspires workers. According to Iwata, it's a term that has guided Nintendo since the early days of the company. "In English, it means 'creating something unique,'" Iwata explained. It was in this room that Nintendo tried to think what it should do to create something new with the Wii U. One of Nintendo's strengths has always been that the company seems incredibly Japanese and traditional, yet at the same time, incredibly innovative and unique. That plainly furnished office with that kanji bursting with creativity is a metaphor for Nintendo itself: Japan's most unassuming rebel, always looking to shake things up with something new, something different, and something dokusou.